With its new, patented measuring process, electric fields from approx. 0,2 kV/m and low-frequency alternating fields up to approx. 20 Hz can be measured. Due to the use of high-grade, wear-free components, the Statometer III can also be used in continuous operation. Due to the geometry of the measuring head, very low field intensities can be measured. The recommended measuring distance of the measuring head to the measured surface is 30 mm. The measuring head is connected to the display unit via a coiled cable. The Statometer III has three measuring ranges which are switched over automatically during measurement. No manual switchover is therefore required. The field intensity meter can be operated both from the mains and with rechargeable NiMH batteries. 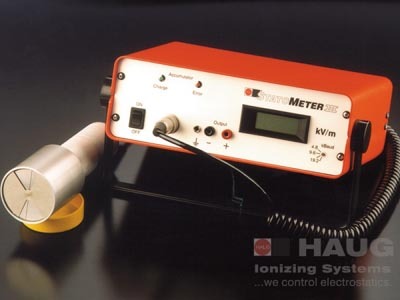 The HAUG Statometer III can be used for the measurement of electric fields or electrostatic charges both in the laboratory and in production machinery. Using the supplied optical connection cable, the Statometer III can be connected to a PC's serial port in a floating connection. The supplied software allows the large display of the current measuring value or the performance of short-term and long-term measurements over several days. The measured values can be displayed graphically and exported, e.g. for further processing in measuring and analytical programs. Variable zooms are possible. The measured data can be saved to hard disk and archived. Standard accessories Measuring case, display unit, measuring head, magnetic holder, batteries, mains cable and optical serial cable (2 x 25-pin), software on CD.